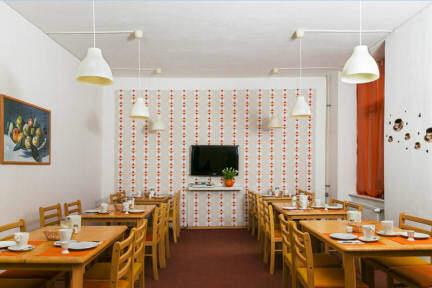 Welcome to 'Pension Intervarko', a friendly and family-run guesthouse in the very center of East-Berlin! Our house is located within walking distance from the famous Alexanderplatz in the vibrant district of Prenzlauer Berg just next to Berlin Mitte. It is an exciting area full of fancy Bars, exotic Restaurants and cool clubs. The tramway departs right in front of our house. It is only two stops to Alexanderplatz from where you can discover the whole of Berlin with three under- and seven over ground railway lines. The Brandenburg Gate and the city's most famous boulevard 'Unter den Linden' are reached in just 10 minutes! You will be at Potsdamer Platz in 15 minutes and on Kurfürstendamm with all its attractions in only 20 minutes. Our guesthouse is mainly frequented by young people - and those who still feel young at heart - who want to explore the city in an inexpensive way. In the morning, we welcome you with a rich and tasty breakfast which is available even for late risers. Our breakfast-times are from 8.00 till 11.00 o'clock. Our reception is open for you from 8 a.m. until 6 p.m. Should you be arriving later than 6 p.m., please contact us at least one day in advance.There is a, one fee of 10.00€ for all check-ins from 6p.m to 11p.m.. Please note that we cannot accept arrivals after 11 p.m. Please note that we take a deposit of EUR 20 for the room key. If you cancel or modify your booking up to 2 days before date of arrival, no fee will be charged. If a booking is cancelled or modified after check-in, it cannot be taken into account anymore. For bookings around New Year’s Eve we ask our guests for advance payment. It was a great place for the price, but the toilets in the women’s bathroom on the 4th floor didn’t always flush. Checking in after hours was confusing and a tad stressful. It was a great location and I would totally stay there again if I went to Berlin on a budget. For the price it was everything we needed and expected. Clean. Cheap. Does the job. This place is really good value. Many of the private rooms in South America and Asia were more expensive than this place. Its two stops away from Alexander Platz on the tram, seems to be a really safe neighbourhood and the street has some cafes and shops on it. It's not a hostel in the traditional sense, so its not the best place to come as a solo traveller if you want to make friends. Its a cheap room to get your head down, if for instance, like me you're the token single person in a group. This clean hostel is far away from the historic districts. It is not accessible without elevators. It is not a 24 hour operation because the office is open between 8:00 am and 6:00 pm or little later. It is close to the tramway. Cheapest private room we could find in Berlin! More of a hotel than a hostel. Very basic but all you need. Not a great place to meet people if that’s what you’re looking for! Our double room was 2 single beds, this should be described as a twin room, the description was unclear. Eerie vibe, didn’t interact with any other guests. No lift which may be an issue for some people. Internet didn't function at all during my visit (the networks existed and I could connect to them, but just couldn't load a single thing). Shower facilities were very lacking. I have no problem sharing, but one single unit shared between 5 rooms is not enough, and it was very small with an empty shower gel container. Curtains did a very poor job of blocking light from the courtyard. Walls are like paper, they tried staying on top of the bathrooms but the showers were never clean. Main doors mainly stayed unlocked, even at night. The staff was friendly but that didn't make up for the room. Worst ever!!! Should have mentioned that its a hostel not hotel.. No kitchen provided, not even a small room fridge.. No cleanliness, beg bugs in room. Unhygienic stuff. Moreover, We had paid for 2 days and for next 8 days were dummy reservation. But when we reached there, they asked us for whole 10 days payment or go somewhere else. Not worth at all.